How Effective is Your Rack Safety System? There are plenty of reasons to prioritize warehouse safety. For one, according to the most recent Liberty Mutual Workplace Safety Index, workplace injuries and accidents cost U.S. employers billions of dollars a year – and falling objects are one of the most common causes. In addition, product that is lost or damaged by falling into the flue space between warehouse racking cannot be sold, resulting in further lost revenue. And finally, the National Fire Protection Association (NFPA) specifies that the longitudinal flue space must be kept clear for effective fire prevention and control. Adrian’s Pallet Rack Safety product line offers effective, simple, and affordable solutions for work area protection and flue space compliance. Our products do not require any tools or retrofitting, install in seconds, and are more affordable than many other safety solutions. We provide simple, affordable solutions to check off the safety measures on the Pallet Rack Safety Checklist, making your workspace as safe as possible. When we show customers how easy it is to install our rack safety products, we are often met with disbelief. We often hear “Why didn’t someone think of that before?” Because our pallet rack safety products were designed to be installed easily and quickly without retrofitting, tools, or outside installers needed, they are much less expensive to install than traditional alternatives. You can see just how easy it is to mount these directly into your rack uprights in the video below. In this closeup view of the rack safety hardware, you can see how easily it installs with no tools needed. Rack Safety Straps are mounted to the back of the rack and act as a barrier to keep large, palletized, or shrink-wrapped items from pushing through into the flue space or falling into a work area. Many insurance companies are requiring that a safety system be put in place to satisfy the National Fire Protection Association (NFPA) NFPA code 13. This can lead warehouse managers to purchase costly rack protection systems which are difficult to install. 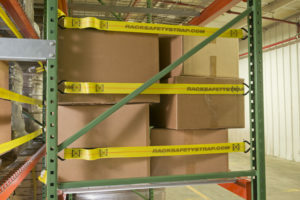 Adrian’s Rack Safety Straps offer a simple, cost-effective solution for warehouse rack arrays. It’s important to measure your racks before ordering to ensure the correct fit. Custom sizes are also available with minimum order quantity. End of Aisle Safety Straps prevent cartons and loose items from falling out of the ends of your pallet racking. 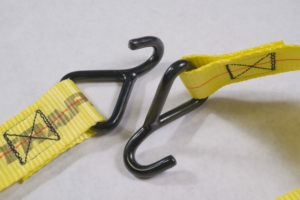 These safety straps are perfect for preventing loose objects from falling into a walkway or work area. End of Aisle Safety Straps work like traditional end of aisle netting without the complicated installation. The straps include specially-angled hardware designed to hook directly into all standard uprights without any tools or retrofitting. Rack Safety Nets add yellow mesh to the super-strong cargo webbing and hardware of the Rack Safety Strap. Rack Safety Nets are perfect for protecting loose, palletized, or shrink-wrapped items. Adrian’s Rack Safety Straps and Rack Safety Nets are made from 2-inch, premium cargo webbing and feature specially-designed hardware that can be attached to the existing pallet rack upright in seconds. Two versions of our pallet rack netting are available. The fixed version can be applied to the front of the rack to prevent items from falling into a work area or to the back of the rack to prevent pallet push-through and loss of inventory into the flue space. The sliding net is designed for the front of the bay to protect work areas and allow for easy pick-and-pack operations. Our warehouse safety products come in standard sizes for bays ranging from 96 to 156 inches. Adrian’s Safety Solutions products can be produced to specification, and custom sizes and solutions are available with minimum order quantity. Our team will work with you to ensure the proper fit and perfect safety solution for your needs. Modular Pallet Rack Safety Netting keeps loose items or cartons from falling into workspaces or aisleways – and onto conveyors, equipment, or employees. We designed the Modular Safety Netting to allow for overlapping or “shingling” of multiple nets, so you can protect any space quickly and easily. Plus, optional carabiner hardware assemblies are available for even more protection, depending on your application. Rack Safety Cables are perfect for the retail environment. They add a high level of safety to your in-store warehouse storage racking by keeping product from tipping into the aisle while still providing good product visibility. Several standard cable sizes are available. Contact us for these special part numbers. Learn more about all our rack safety products on our YouTube page. Adrian’s Safety Solutions partners with material handling dealers throughout the U.S. and abroad. Use the warehouse rack safety products dealer locator to find the dealer nearest you or feel free to call us directly with any questions. You can also direct your preferred dealer to us and we will be happy to work through them. All rack safety products are available for structural and other racking systems. Email us for these special part numbers! Ready to make an order? Have more questions? Contact us! We’re happy to help.